Learning to read can be one of the most challenging aspects of a child’s first school experiences. The path to reading proficiency is much easier when there are literacy supports at home. The beginning of the school year is a great time to establish literacy routines at home to extend the learning opportunities happening at school. 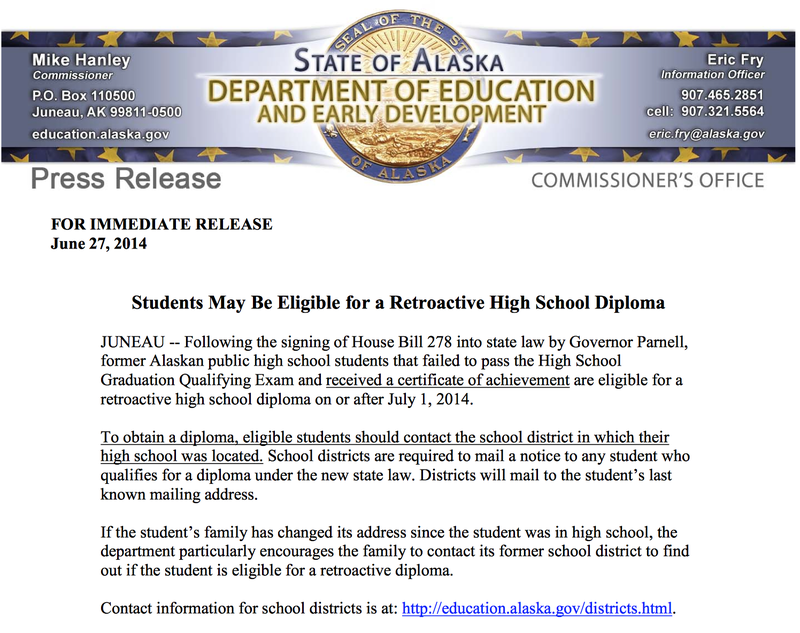 Here’s some help from the Alaska Legislature and Alaska Department of Education & Early Development. One of the most exciting aspects of the first day of school is the arrival of our kindergartners. They are as energetic, enthused, and eager to learn something new as anyone in the building. After the initial excitement wears off, there is a lot of hard work to do in order to keep up with learning expectations. This brochure provides some helpful information for preparing your kindergartner for the first day of school. Please take a moment and share on your Facebook timeline or forward to someone with a pre-kinder. Click here to read the press release: Board results June 2014. Here come the SBAs, HSGQE, AYP, ASPI, and don’t forget A, P, BP, and FBP. Alphabet soup! Get your spoons and crackers ready; spring testing is just around the corner. Each year during the first week of April, Alaskan students in grades 3-10 participate in statewide mandated testing. These tests measure students’ knowledge of specific learning standards called “grade-level expectations.” The results of the tests are used by educators to place students academically and by state officials to hold schools accountable for student achievement. The purpose of the Standards Based Assessments (SBAs) is to (a) determine on a statewide basis the extent to which students are meeting statewide performance standards; (b) produce statewide information that enables sound decision making by policy makers, parents, educators, and the public; and (c) provide a focus in order to improve instruction [4 AAC 06.700]. It [HSGQE] tests students’ proficiency in state standards established to reflect what high school students should know as a result of their public school experience. The examination includes three subtests: mathematics, reading, and writing. Students must show proficiency on all three subtests to qualify for a diploma. Measurement of student learning is important for the students, parents, and educators. The data from these assessments and other classroom assignments are used to make instructional and programmatic decisions at the school, district, and state level. Testing week (April 1-4) can be stressful for teachers, administrators and students. Your efforts to support students and teachers during testing are appreciated. A good night’s sleep, healthy breakfast, and balance of high-expectations and encouragement will motivate students to focus on performing well. With your help schools will have a positive week of participation in Alaska’s Comprehensive System of Student Assessments. Once we successfully complete this year’s requirements, we’ll start planning and looking ahead to EED’s implementation of a completely new assessment system for the 2014-2015 school year. Stay tuned. For more information about Alaska’s Assessments, visit http://www.eed.state.ak.us/tls/assessment/.